The amazing longevity of granite and marble countertops, which can be twice as long as other countertop materials – over 100 years – as reported by the National Association of Home Builders, is what makes granite countertops and marble countertops among the most sought-after kitchen elements. The popularity of granite and marble kitchen countertops is why you need the most popular stones and the most sought-after stone colors in your inventory. The lifespan of a granite countertop is highly influenced by its care and maintenance. As natural stones both granite countertops and marble countertops are porous (marble more so than granite), which means they will absorb any liquids spilled on it. Additionally, food particles and other debris can accumulate over time. The experts at SlabMarket can help you select the most popular stones and the slabs that perform the best as kitchen countertops to include in your inventory. The professionals at SlabMarket understand the strengths and weaknesses of granite and marble kitchen countertops that can prevent as well as lead to damage over time. Although some weaknesses, like not being properly sealed, may not affect the actual longevity of granite and marble surfaces, in the long run, some conditions may leave them exposed to staining from acidic materials. Additionally, the use of harsh cleaners can make your kitchen countertops more susceptible to breaks and chips. Marble is not typically recommended for the high-traffic countertops found in busy kitchens, although it’s durable and versatile and can easily last a lifetime when properly cared for and maintained, including a more frequent resealing schedules. Marble, onyx, limestone, and sandstone, are generally more porous than granite vanities and countertops, therefore, more prone to staining and etching as stated above. However, many homeowners are determined to use these products so having them available for customers to review is critical. SlabMarket can help you fill a container of amazing marble, onyx, limestone and sandstone slabs. 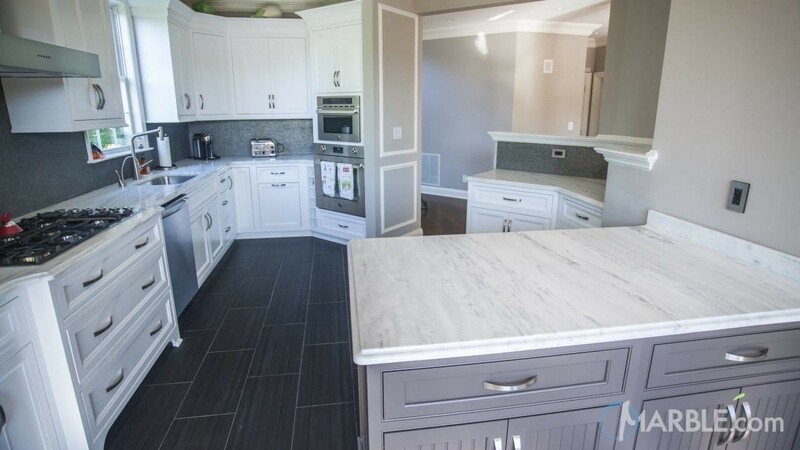 Engineered stone countertops like quartz generally have a much shorter lifespan than natural stone materials, although it’s easy to think the resins which are used to bind the stone would make this material invulnerable to damage, however, this isn’t always the case. While the resins do make the surface nonporous, they are more prone to damage from heat and sun exposure so we would not recommend this stone for use outdoors. SlabMarket can provide a wide array of man-made stone slabs for your inventory. If your customers are concerned about the longevity of a natural stone countertop, then you’ll have the information and the slabs to convince them otherwise. With the proper care and maintenance, natural stone kitchen countertops continue to perform impeccably and last at least a lifetime. Call SlabMarket today to get started adding these popular and sought-after slabs. View one of our favorite kitchens on Marble.com!